Situated on 45 acres in the Great Smoky Mountains, this mountain lodge sits at 2700 feet in elevation, and is just minutes from downtown Asheville, NC and the Biltmore Estate. Construction on Wildberry Lodge began in late 1999 and was completed in early 2002. 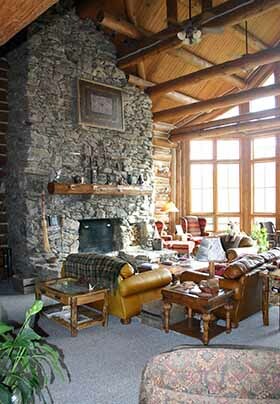 The main building was constructed out of red pine logs, hand crafted and assembled by Maple Island Log Homes. 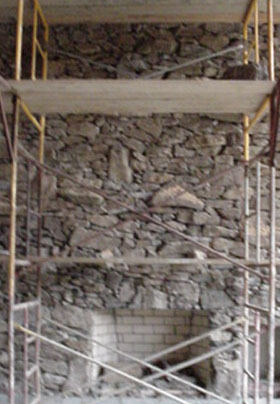 During construction, innkeepers Ken and Glenda worked diligently to stain and chink (filling between) the logs. The lines of chinking that had to be filled are estimated at three miles in length! Decorating the Lodge was the fun part of the innkeepers’ dream. The decor is rustic but sophisticated and luxurious but casual – you can really relax without “roughing it”. Throughout the buildings you’ll find eclectic artifacts from all over the world, along with original local art (paintings, pottery, brooms, fabric, etc) that you can experience – some pieces are also for sale. The Lodge opened in May of 2002 with 3 guestrooms. One additional room and the Blackberry suite were added in 2003. The second building, “The Cabin at Wildberry,” was completed in 2009 and houses two suites. The top-floor suite is the Honeymoon Suite, the most luxurious accommodation at the inn with a spa bathroom that cannot be beat. The decor is in the same spirit as the main lodge: luxurious, but not formal. The first floor of the cabin houses the Wineberry Suite which was opened in October, 2012. This suite features a private bedroom among other amenities. The Forest Retreat with its two decks and stone fire pit with stone-slab benches was completed in July, 2011. You’ll find this outdoor gem a short walk from the lodge on a lighted pathway. The Jacuzzi hot tub and Tipi relaxation deck was completed on April 30, 2014. Located at the foot of the fire pit trail, this new area will provide much needed “R&R” for our guests, whether they are weary hikers, urban escapees or simply looking for a great way to relax! The hot tub has a great view of the mountains and valley. The innkeepers at Wildberry Lodge continually strive to expand and improve the property, taking note of guest suggestions and requests. You never know what new details you’ll find each time you visit!